What will our daily live be like? For part of the answer, I go to Genesis and study the description God gives us of Adam and Eve's life before the fall. They had meaningful and enjoyable work. (To care for the garden and the animals), abundant food (they could eat of any tree save one), a beautiful environment, unhindered friendship with God (He would come and walk with them in the evening) and relationships with other people and animals. They also had a day of rest, just like God ordained. So, rest and relaxation will definitely be a part of our lives in Heaven. Sound good? Aren't these all the things we all strive for in our earthly lives? Also, as we've already discussed, each of us will be given important tasks of rulership in Heaven (or the new earth) These will be things we not only enjoy but that are talents are perfectly suited for. No more dragging yourself to work or school and staring at the clock waiting to go home. No. I imagine we will all be anxious to get to work each morning. We will look forward to it with great anticipation because our work will fulfill us and through it, we will please God. Work was created before the Fall and was meant to be enjoyable. God, Himself, is a God who enjoys work. Why shouldn't we? Will we sleep? Eat? Play? The Bible speaks a lot about rest and entering our rest, but will we actually sleep in heaven? I don't believe the Scriptures are clear on that. Our bodies will be perfect but will they ever run down, get tired? My personal opinion is that they won't, but I don't know for sure. For those of us who enjoy sleep, perhaps it will be a part of your routine. For others, like myself, who struggle getting a full night's sleep, and would rather stay up and be productive, perhaps we won't need to sleep. Either way, it's heaven, and it will be perfect. As I discussed in a prior post, would it be heaven if we couldn't eat? Our best example of this is the resurrected Jesus. In His glorified body, he both ate and drank. Also Revelation speaks of a grand wedding feast. So, yes, I believe we will eat, and we will enjoy it. I receive vegetables and fruit from a local organic farm and I have to say that the fresh produce is so much more flavorful and so much better than the stuff you buy in a grocery store. But I believe food on the new Earth will be even better. I can't wait. Will we play? Just look at all the fun activities God has created for our enjoyment on earth. Sports, Art, Music, Movies, Good Books, Games...etc. 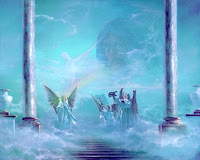 Do you think those will end in Heaven, on the new earth? The Bible tells us that Every good thing comes from God. My opinion is that they will not end, but be even more fun, even more enjoyable. Maybe you've always wanted to oil paint but didn't have the time or talent to pursue it. Perhaps you'll be able to in Heaven. Maybe you've always wanted to play baseball, but in this competitive, crooked world, you never made it. Maybe in Heaven you can play with the Angels! Jesus said in John 14 "In my Father's house are many mansions. . .I go to prepare a place for you." To me, this means that we will all have homes just like we have here on earth. Places that are just ours where we can go after working or playing and just rest. Places with our most precious things set around us, where we can have guests over for dinner or a movie. Why not? Isn't that one of the wonderful things we enjoy on this earth? And since Jesus is preparing it, I believe He'll stock our homes full of the things that mean the most ot us. He'll furnish it according to our tastes and needs. He knows everything about us. I truly beleive that when we first walk into our new house, we'll feel like we finally have arrived home. 1. Will animals inhabit Heaven or the New Earth? 3. How will people and animals relate? Most of these discussions are taken from Heaven, by Randy Alcorn. Highly recommended book if you want to know as much as you can about where you're headed.